is a postdoctoral fellow at the Program for Evolutionary Dynamics at Harvard University. ‘What is life?’ In 1943, Erwin Schrödinger posed this question in a series of lectures at Trinity College, Dublin. Already famous as a hero of the quantum revolution, he charged scientists with a new mission: to begin to account for the activity of living creatures using tools and intuitions from physics. Seventy-five years later, the biophysics revolution is ongoing. Schrödinger’s call to action inspired his colleagues to look at the building blocks of life at all scales, from the diminutive DNA molecule to schooling fish and the construction of anthills. My research group at Harvard University focuses on altruism, or why creatures sacrifice themselves for the common good. But rather than relying on psychology or moral philosophy, we approach this problem using thermodynamics – how the laws governing heat and the interaction of microscopic particles might translate into macroscopic behaviour. Can we explain altruism by casting humans as atoms and molecules, and societies or populations as solids, liquids or gases? We model altruism as a simple interaction between two individuals – say, Ayla and Babak. Both must pick one of two options: cooperate or defect. If Ayla cooperates with Babak, she pays a small cost, say $1, to a central bank that immediately gives $5 to Babak. Defecting equates to doing absolutely nothing. Therefore, if both players defect, their personal balance is unchanged; if both players cooperate, they each gain $4; if one cooperates and the other defects, the former loses $1 and the latter gains $5. The rules at work are fairly simple, and we can easily imagine some large-scale consequences. Economic prosperity will be highest, for example, when everyone cooperates. What’s good for the community as a whole also seems good for the individual. However, global cooperation is not so easy to attain, which is where things get interesting. Imagine a large number of individuals, interacting according to this cooperate/defect model, but unable to see or speak to one another. Without any actual physical interaction, there’s no way to recognise an individual on the ‘other side’, so everyone picks either cooperate or defect, and sticks with it for many interactions. Next, imagine that individuals are allowed to compare their respective profits every now and again. If a cooperator and a defector compare pots, the cooperator will always be disappointed – a defector gets $5 per cooperator in the room, but a cooperator gets $4 per cooperator and loses $1 per defector. The disgruntled cooperator will switch to defect, increasing the financial load on cooperators, who are driven further and further into debt until everyone has switched to defect. But this can’t be right. Despite the apparently law-like tendency towards selfishness, we still see examples of cooperation and self-sacrifice all around us, even when individuals are ‘invisible’ to each other. Citizens can make sacrifices during blackouts and droughts for the sake of maintaining the flow of electricity and water, and people will occasionally risk their lives in order to help total strangers. It turns out that our thought experiment has two fatal flaws. The first is that we don’t behave the same way around everybody: we’re more likely to cooperate with friends and family than with strangers. Our ideas about the microscopic rules of interaction might be wrong. Secondly, we might be naive about which individuals interact. Even if we keep with our very simplified rules, it’s unrealistic to assume that everyone is equally likely to come into contact with one another, especially in bigger groups. In fact, the fine details of the social network – who is connected to whom, and how many people are involved – have an incredibly strong impact on the behaviours that flourish or perish within it. Martin Nowak is the head of our lab; he says in his book SuperCooperators (2011), co-authored with Roger Highfield, that you can look at population structure as you would the phases of a physical substance. 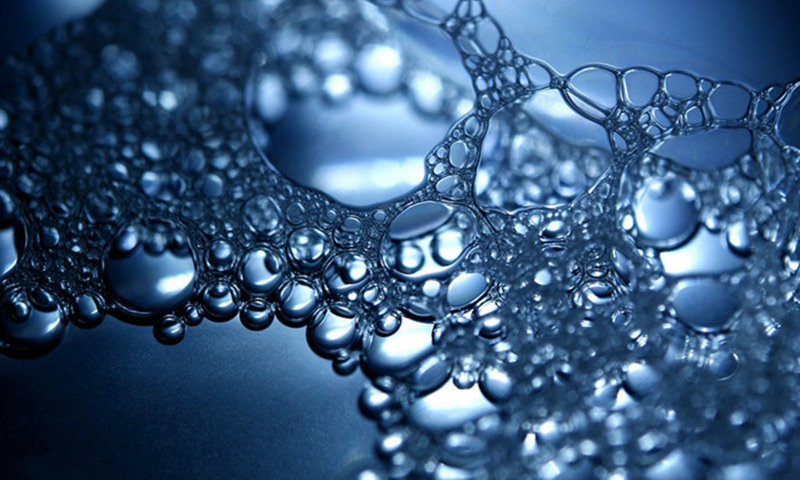 Think about H2O molecules bumping into one another. The population structure of ice (where molecules are unmoving and can ‘see’ only a few others nearby) will produce a different set of interactions to water (where molecules often ‘see’ the same close neighbours often, but also move around and explore other neighbourhoods) or steam (where there are no familiar neighbours, and molecules careen about wildly). Raising the temperature of a solid will eventually turn it into a liquid, and then a gas. Similarly, we can think of a kind of ‘social temperature’ that dictates the rate at which people interact, and how unfamiliar they are to us. In the thought experiment, we often encounter people we hardly know, much like a hot gas of molecules crashing into one another, or forcing our way through a crowd to board the subway. In this scenario (much like in real subways), it is hard to foster cooperation. What happens at the other end of the spectrum – in ‘solids’? A solid population would be unchanging, just like the molecules in a brick or rock. You’d always see the same people, and know their reputation and behaviour. For most of us, this solid, crystalline phase represents the backbone of our social life. We have long-lasting connections to friends and family, and interact with them often, but don’t see as many friends-of-friends or family members several-times removed. The fact that these connections are rare can help to insulate you from defectors. If there is one defector on the subway platform, you might be susceptible to getting swindled – but if your cousin’s partner’s plumber, Donny, happens to be a defector, you are unlikely to be affected in any way. So if we start with connections between everyone, as in a gas, cooperation will fail – because everyone is susceptible to the few jerks. But if we begin to snip these social wires, we might produce connected cooperators who are well insulated, feeling the effects of defectors only through friends-of-friends-of-friends. Solid semiconductors – bits of metal that are the backbone of every gadget in the modern world – open up another perspective on the physics of altruism. In semiconductors, changes in the microscopic structure of a metal can affect how much electricity must be applied to ‘activate’ it, such that the amount of current passing through jumps from zero to a particular number. Similarly, a recent paper in Nature written by my colleagues predicted how large a financial reward (the electricity) is required for altruism to ‘turn on’ and spread through a group (the semiconductor). Some networks require a reward of $1.05, for example, and are pretty great conductors of altruism; some demand $100 or more, and are very difficult to activate. What about ‘liquid’ populations? In an earlier paper, we examined how cooperation conducts in supple social materials such as clubs, workplaces, coffee shops and artistic movements. Here individuals belong to one or more groups and can change their memberships as they like. If it’s easy to switch, then a liquid almost effortlessly sustains cooperation – at the sign of the first defector, all the cooperators simply leave and restart the organisation elsewhere. But when there are barriers to migration, rules-of-thumb start to appear. If moving is costly, cope with defectors for as long as you can before leaving; otherwise, bail and take as many cooperators with you as possible. Of course, the real social fabric is a complex mix of populations in many phases. We have strong ties that we occasionally form and break; we join and leave organisations quite freely; we have hundreds of micro-interactions with a gaseous mix of strangers in trains and airports. However, by studying each of these phases as physicists, we come away approaching a recipe for altruism – rules for certain structures that might foster cooperation. What we’ve observed so far is that strong local connections enhance altruism everywhere. Mobility and flexibility put a brake on defection, but we can’t have so much as to create a gaseous regime where cooperation is stifled. Scientists still have a long way to travel to understand the physics of biological systems – but I like to think Schrödinger might be pleased by how far we have come.